1. What is a tissue? Tissue is a group of cells that are similar in structure and are organised together to perform a specific task. 2. What is the utility of tissues in multi-cellular organisms? In multicellular organisms, cells are grouped to form tissues. These tissues are specialised to carry out a particular function at a definite place in the body. Different types of tissues perform different function.It is because of this division of labour that multicellular organisms are able to perform all functions efficiently. 1. Name types of simple tissues. 2. Where is apical meristem found? Apical meristem is present at the growing tips of stems and roots. 3. Which tissue makes up the husk of coconut? The husk of a coconut is made up of sclerenchyma tissue. 4. What are the constituents of phloem? 1. Name the tissue responsible for movement in our body. The muscular tissue is responsible for movement in our body. 2. What does a neuron look like? They are highly specialized for being stimulated and then transmitting the stimulus very rapidly from one place to another.Nervous tissue contain unit cell called nerve cell or neurons. (1) It consist of cell body which contain central nucleus and cytoplasm from which long thin hair like part arises called dendrons. (2) The axon is a single,long,cylindrical structure that conduct electrical impulses away from neuron’s cell body. (3) The dendrons further branches into dendrites. 3. Give three features of cardiac muscles. (1) They are made up of branched, cylindrical and uninucleate cell. (2) Each cell is surrounded by sarcolemma, has cytoplasm with longitudinal myofibrils, intercellular spaces are filled with loose connective tissue and blood capillaries. (3) They have stripes or light and dark bands.They occur in heart. 4. What are the functions of areolar tissue? (i) It helps in supporting internal organs. (ii) It helps in repairing the tissues of the skin and muscles. 1. Define the term “tissue”. 2. How many types of elements together make up the xylem tissue? Name them. (1) Tracheids: They help in transport of water and minerals vertically. (2) Vessels:They help in transport of water and minerals vertically. (3) Xylem parenchyma:They store food,helps in sideways conduction of water. (4) Xxylem sclerenchyma(fibre):They are supportive in nature. 3. How are simple tissues different from complex tissues in plants? They are made of only one type of cell which coordinate to perform a common function. They are made up of more than one type of cell. The cells are similar in structure and perform similar function. Different types of cells perform different function. 4. Differentiate between parenchyma, collenchyma and sclerenchyma on the basis of their cell wall. Cell walls are relatively thin and cells in parenchyma tissues are loosely packed. The cell wall is irregularly thickend at the corners, and there is very little space between the cells. The cell walls are uniformly thickend and there are no intercellular spaces. The cell wall in this tissue is made up of cellulose. Pectin and hemicellulose are the major constituents of the cell wall. An additional layer of the cell wall composed mainly of lignin is found. 5. What are the functions of the stomata? Stomata allows exchange of gases during respiration and photosynthesis, during transpiration too, water vapour also escape through it. 6. 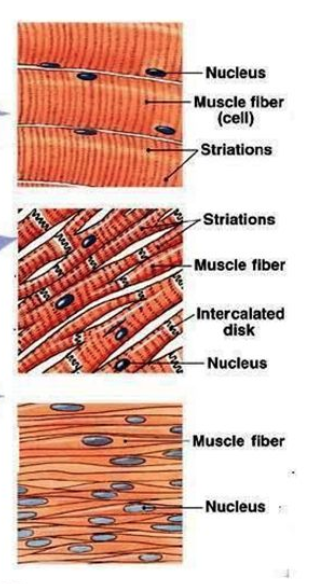 Diagrammatically show the difference between the three types of muscle fibres. The three types of muscle fibre are Cardiac muscle cell, skeletal muscle cell and smooth muscle cell. 7. What is the specific function of the cardiac muscle? They contract and relax rapidly, rhythmically and tirelessly throughout life.Relaxation and contraction of these muscles helps to pump and distribute blood to various body parts. 8. Differentiate between striated, unstriated and cardiac muscles on the basis of their structure and site/location in the body. 1. Shape of cells Cells are long cylindrical non tapering and un-branched Cells are long with tapering ends (spindle shape) and un-branched. Cells are non-tapering cylindrical branched. 2. Nucleus Many nuclei (multi-nucleated) which are situated towards the periphery of muscle fibre. The cells have only one nucleus (uni-nucleated) situated in the center. Each cell contains one or two nuclei situated in the center. 3. Striation Transverse alternate light and dark bands present. Striations or strips are absent. Cells have faint striations. 4. Mode of Contraction Voluntary contract rapidly but soon undergo fatigue. Involuntarily not at our will. Contract comparatively slow but do not fatigue. Involuntarily, rhythmically contract and relax throughout life without fatigue under normal conditions. 5. Example of location Hands, legs and other skeletal muscles. Stomach wall, intestine, ureter, bronchi etc. Present in heart. 9. Draw a labelled diagram of a neuron. 11. Identify the type of tissue in the following: skin, bark of tree, bone, lining of kidney tubule, vascular bundle. 12. Name the regions in which parenchyma tissue is present. It is present in cortex and pith of stem and roots.It is present in mesophyll of leaves. 13. What is the role of epidermis in plants? It is the outermost layer of cell.It is made up of one cell thick or single layer of cells. Cells of epidermis are elongated, flattened, do not contain any intercellular spaces between them. They protect plant from loss of water,mechanical injury and invasion by parasitic fungi. 14. How does the cork act as a protective tissue? The outer protective layer or bark of a tree is know as the cork. It is made up of dead cells.Therefore, it protects the plant against mechanical injury and extreme temperature.It also prevents the loss of water by evaporation.